Today is the birthday of my brother, Jeff. He is younger than I am, but not by much, and he has always seemed wiser than his years. What grownups call an old soul. After decades of living in Manhattan, working on the Letterman show as "the guy who looks a little like me", many corporate events, a successful run of his own comic book store..he moved to Los Angeles last year. When I was working in a corporate office (with a door and a window to outside just outside my door..as close as I got to outdoors during that stint!) I had the opportunity to visit him often, as his store was right close to our sisters house, where I stayed. Regular access to my siblings for that time was amazing, and I admit I miss it. 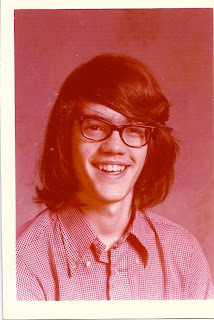 The first photo here is of Jeff, he must have been in junior high school. The second photo is of our father, to whom my brother Jeff bears a striking resemblance. These 2 pictures came to me via another brother, Art, who was here recently, after visiting family in St. Louis. 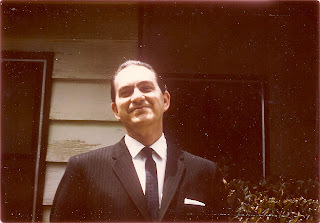 I have no recollection of the picture of our dad, but it sure seems appropriate to post, as Jeff has been been making my father's brothers jump when they see him, as the initial sighting must conjure up memories. Jeff is a focused and smart guy. When we were kids, the Rockville recreation summer system offered all sorts of outlets for creativity. Jeff was in elementary school and wrote, directed and acted in skits that would be presented on stage to the entire community. I remember watching in awe as he put these events together. I still do watch him in awe as he publishes his first book, continues to write scripts, treatments, episodes, comics..the ideas pour from him..truly an inspiration. Happy birthday!